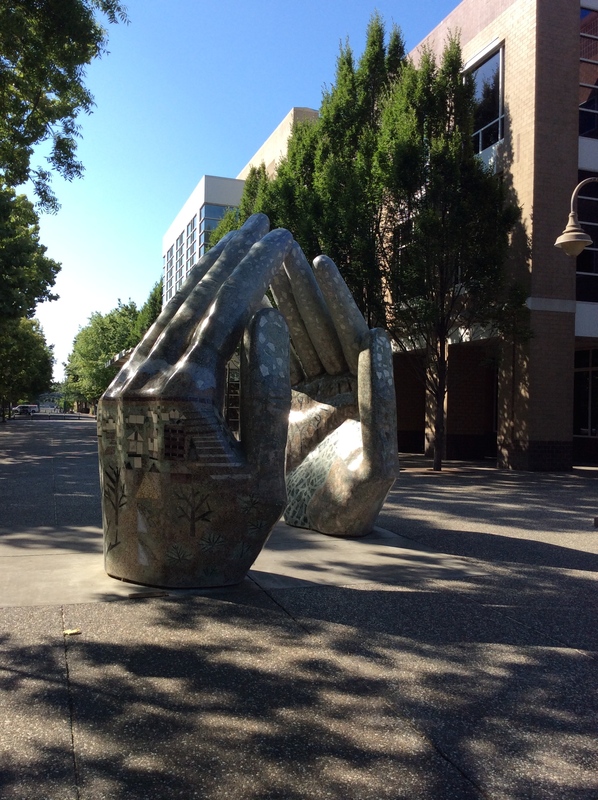 The Hands, Chico CA. I love this sculpture. Well. It’s Memorial Day. A day to give thanks to all the people who have gone to fight for our country. It always seemed so distant when I was a child, because I didn’t know any veterans. Or I didn’t know I did. But after so many recent years of war, it seems much closer now. I’m so sorry for those who have lost loved ones, and so thankful for the freedom we have. I pray that now the wars stop, that we somehow change our focus to one that is peaceful and nourishing for everyone. 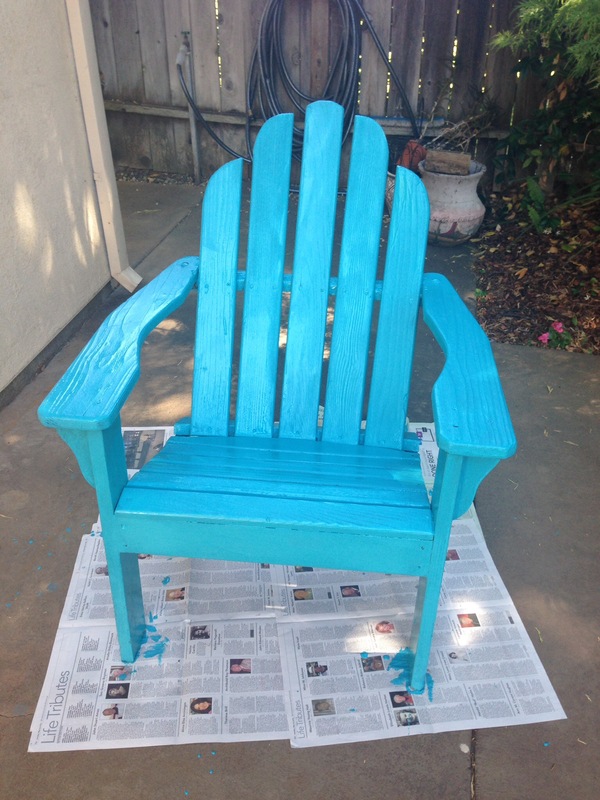 So far today I’ve gone shopping and painted an Adirondack chair. And watched three episodes of Grace and Frankie. (Have you watched that? It’s a Netflix series. Good one. Funny and not funny. Family stuff with Jane Fonda and Lily Tomlin and Martin Sheen and that guy who was on Law and Order SVU, I think. ) And watered the thirsty things that grow in my garden. 1. The painted chair: I have been preparing for a while now to paint an outdoor chair. I put a coat of paint on it today and I don’t know if the chair will ever get dry. The paint seems peely. Maybe it’s the wrong kind. I guess I’ll find out in time, when it either stays on there or it doesn’t. I’m not worried about it. It’ll look cuter than it did. The thing is, I think it may need some touchup but when I try to sand it it starts peeling off. So I’m thinking maybe latex paint was the wrong idea. I really don’t know about this stuff. I just like the color. It’s an old chair I bought back in 1995. I painted it with polyurethane so it wouldn’t get ruined on my front porch and it held up really well until I put it out on my balcony and left it there over the winter. The winter won, the polyurethane gave up. So now I’m painting it turquoise. I was going to stain it but it had a huge greasy looking stain on the back and I was afraid the stain would’t stick to it. So now it’s turquoise. I wish I enjoyed this kind of work more. I like the outcome, but I lack the skill to do it really well. I’m going to try rubbing a dark stain over the turquoise, just to see if it gives it a deeper look. I’ll try it on a board first. After one coat of paint. Before I try rubbing stain on it. 2. 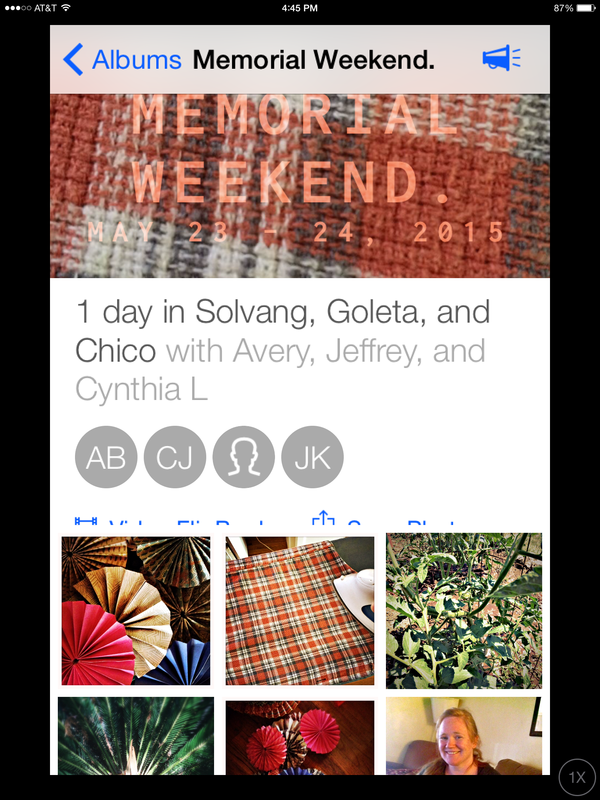 App of the week: DSPO.Do you know this app? It’s an app made by Hipstamatic, my all-time favorite camera app. It’s pretty cool. You create a ‘camera’ which is actually a photo session. You decide how long it will last and who all you will invite to participate in it. It doesn’t matter where they are. Then you all just shoot photos for the whole time, and when the time is up, it’s up. Then and not until then, you can all see all the photos. They give you about 4 filters you can use, and for a dollar you can get maybe six more, so you have some control over the look of the photos. It’s like a surprise photo album. This weekend we’ve done two of them. My daughter and granddaughters are in Paso Robles and the rest of us are in Chico. When the camera time runs out, we will all see what each other has been doing. Like watering flowers and painting a chair. Except the people who are on a trip seem to be doing slightly funner things. Like going to parks and playgrounds. If you haven’t tried it you might want to. It’s a fun family or friends thing to do. 3. Whole 30: Avery and I are doing one, as you may recall. We’re on about Day 18. We started strong, and then four days in we discovered that our bacon had sugar in it, like almost all bacon does. We had to start over. So far all I really miss is heavy cream for my coffee. Coffee with unsweetened unthickened almond milk is okay, but it’s not coffee with heavy cream. Other than that, it’s gong well. I feel less puffy, and the arthritis in my hands isn’t hurting. I’m not craving anything really and it’s pretty easy to make good food. It is a matter of changing one’s perspective. I can’t marinate meat in anything with soy sauce, so I seasoned some coconut milk and marinated it in that. And I made cauliflower rice to go with it. It was good. At the beginning of this journey, we went to our gym and got weighed on this device that tells you your percent of body fat (OMG), BMI, weight, water weight, etc. It really tells you way more than you want to know. We are going to do it again at the end of the 30 days of the Whole 30. It’s an experiment. I’ll let you know how that turns out. 4. School: Nine school days left. The last three barely even count because wither the kids will be gone doing fun things or the classes will be really short. So, it’s the time when we start cleaning up and getting ready to shut down another year. In my classes the students have been doing music presentations. Each student picked a song and then prepared a Haiku Deck (sort of like a PowerPoint but way easier and prettier) that told a little about the artist and why they liked that song. They played the song for the class and then showed their Haiku Deck. At first they complained that ALL the music has bad words. I had to approve the lyrics of their song before they could use it, and some kids really struggled. They’d bring these songs to me and I’d have to point out all the ‘b’ words and ‘f’ words and so on that they don’t even hear. I talked about how powerful music is to touch our hearts and emotions, commenting that the lyrics reach us sometimes because they are part of music, in ways that the words on their own wouldn’t. I asked them to consider what they are showing themselves if the only music they ever listen to is not ‘school appropriate.’ I asked, “What are you feeding your brain and your heart by only listening to that music?” They struggled, and ultimately I suggested that if they really couldn’t find anything else they should consider oldies. I know they love that music and those songs were created in a more innocent time, when the things singers say today wouldn’t have been uttered publicly. I’m happy to say that this project has gone really well. They’ve enjoyed each other’s music and applauded loudly after each presentation. And without realizing it, they’ve done critical reading, listening, created a tech presentation and spoken in front of the class. 5. Summer Plans: I’m setting up a week-long mosaic class with a local mosaic artist. I’ve invited local people to participate, and the date is set. If we don’t get enough participants the teacher will open it up to her list of people. This will be the third time I’ve done this. It’s really satisfying. So far we have four participants. We are also going to do a painting with an artist thing here, out on my patio. That should be fun as well. Other than that, and the two trips I’m taking and some professional development days, it’ll be a lazy few weeks. It’ll be a good summer for visitors. Hint hint! And that’s it for today. Have a great week, filled with all the things you love to do. Wow. A lot of activity here, friend. You are on the move and flourishing, pushing yourself and getting ready for summer. I love the app you describe but it probably won’t work for me. I usually shoot on my own. But cool. Tell me more about it. Yes, Bonnie, lots going on! The app I spoke of is like a surprise. I could see you using it in a conference or some sort of group activity time. You’d set a camera for an hour and invite a number of people in. Then all would shoot away with their phones until the time ran out. Then you’d get a look at what everyone was seeing, all in one big album. I don’t know if that makes sense. It really is fun. I wish I could link an album for you to see. I’ll try. Have a great week! Jeannine, it’s a sweet series, isn’t it? I binge watched it and was disappointed when it was over!